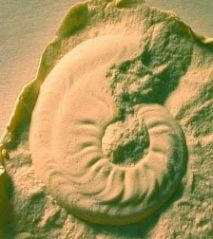 Fossil Cephalopods from the Lusitanoceras granosum zone were first described from rocks in Utah by Miller, Youngquist and Nielsen in 1952. They are found in the Camp Canyon Member of the Chainman Formation in West Central Utah. For some reason ammonoids in this zone had stronger longitudinal lirae than those that came before and after. 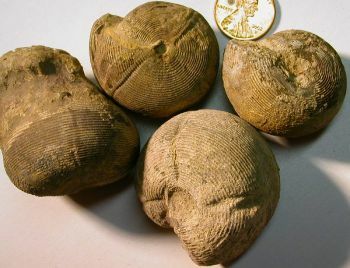 Lusitanoceras granosum (shown above left and left) is a globular, almost spherical, only slightly compressed ammonoid with longitudinal lirae, and a rather small umbilicus. 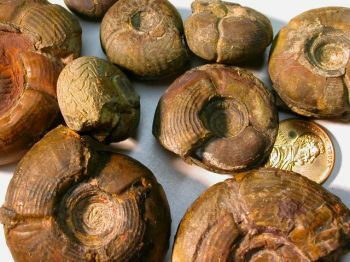 This species was refered previously to Goniatites granosus. 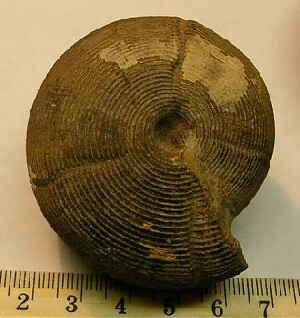 Lusitanites subcircularis, formerly Neoglyphioceras subcircularis is another longitudinally lirate ammonoid, the difference being the sinuous constrictions and the compressed form. The specimen on the left is 14mm dia. and the one on the right is 22mm dia. 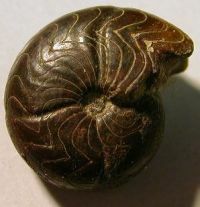 Described as Lyrogoniatites utahensis in 1952. These are fairly common wherever the Camp Canyon Member of the Chainman Formation is exposed. The left specimen is 44mm dia. and the ones in the right photo range from 25mm to 50mm. 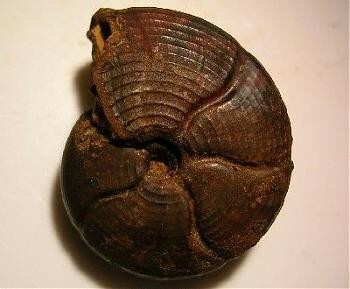 Sulcogirtyoceras ornatissimum is intermediate between Girtyoceras and Eumorphoceras. 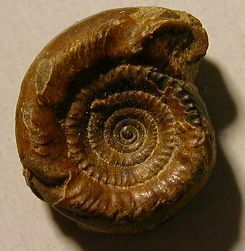 Both Girtyoceras and Eumorphoceras have an oxyconic shell at maturity, the former having constrictions ornamenting the juvenile shell and the latter having ribs. 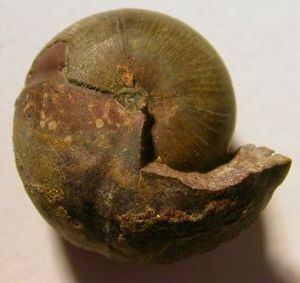 Sulcogirtyoceras, found in rocks younger than those containing Girtyoceras and older than those containing Eumorphoceras has both ribs and constrictions on the juvenile shell. These two photos show the dimorphic character of the dimorphoceratids, the left photo is of the juvenile shell, it is actually 11mm diameter. The right photo is a latex cast of an older individual, still showing some of the juvenile characters, the ventro-lateral sulcus is forming, and the ribs and constrictions are starting to disappear, it has not yet reached the oxyconic stage of maturity, it is 25mm diameter. Back in the '40s almost all late mississippian goniatitic ammonoids found in the U.S. with an acute narrowly rounded or sharp first lateral saddle were refered to Goniatites choctawensis, and the ones with a rounded first lateral saddle were refered to Cravenoceras (see Miller and Furnish 1940). This just shows how things change with each generation of paleontologists. These two specimens are the only fossils I have found that can be refered to C. choctawensis. 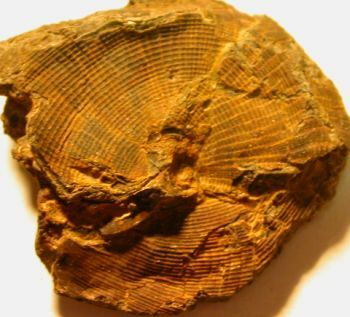 The top specimen is an internal mold with part of the shell preserved. This is a crushed shell of a rather large adult ?C. choctawensis? that shows the crenulate pattern of the sculpture and growth lines. 11mm diameter, the ventral lobe of the suture is divided into four smaller lobes, which are each again divided. 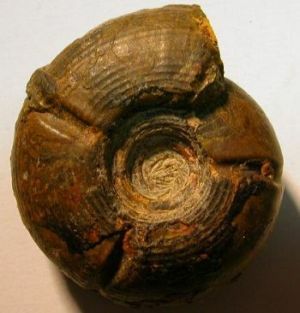 Mitorthoceras, an orthoconic nautiloid, is quite common in this part of the Chainman Formation, usually found only in sections. This photo is about 10x natural size to show the fine tranverse lirae. 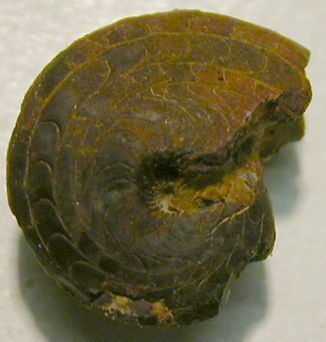 Notice the shell repair at about the midpoint of this specimen.